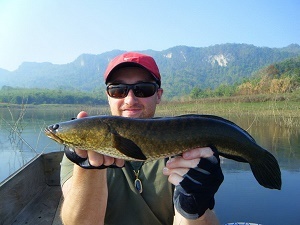 Returning client Paolo from Italy made his annual trip back to Thailand fishing Khao Laem Dam for Giant Snakehead and other native predatory fish. After a three and a half hour journey by minibus deep into central Thailand the angler arrived at the picturesque Khao Laem National Park and the stunning Khao Laem Dam. A quick transfer by longtail boat to his overnight accommodation in the form of floating bungalows situated on the large natural lake the Italian angler bedded down for the night in readiness for the next days lure fishing. The angler awakened early the next morning and was soon being transported across the flat mirror-like surface of the gigantic natural dam to the first potential fishing area of the day. The angler was soon moored up on the edge of a submerged forest and began to methodically search the water with his artificial frog lure for any snakeheads that might be laying in wait in readiness to ambush unsuspecting prey fish. After several retrieves across the edge of the mass of sunken trees the imitation frog was savagely attacked by a Snakehead several metres from the boat. As the Italian angler set the hooks all hell broke loose as the Snakehead angrily thrashed its head before making a beeline for the nearby underwater snags. The light weight spinning rod arched over as the angler applied maximum side strain in an attempt to keep the predator out of the trees. With the spool tightened as much as he dare the angler soon had the Snakehead out of the danger area and in open water allowing him to loosen the clutch and play the Snakehead with slightly more finesse. Several minutes later a beautiful Striped Snakehead was lifted from the water before being unhooked in the boat. The Striped Snakehead was estimated to weigh 2kg’s and was quickly returned to the water after a few trophy shots. After several more casts which failed to get any interest the angler moved on to the next potential holding area. Further casts soon had the desired effect as Paolo succeeded in landing another slightly larger Striped Snakehead before once again the swim died. With the sun now rapidly rising over Khao Laem Dam the weather became exceptionally hot and uncomfortable and saw no further Snakeheads landed before lunchtime. After taking an extended lunch under the shelter of the floating bungalow the angler once again resumed his search for the elusive Giant Snakehead. Paolo tried fishing several other potential holding areas receiving further hits from Snakehead but failed to connect with the wily predators.